He was done watching professional baseball. In his mind, the sport had become all about the money, and that disgusted him. Mike Kaffee grew up a Yankees fan, and that’s an understatement. He was a full-fledged, obsessed follower who knew the lineups like the back of his hand. Mickey Mantle, Roger Maris, Yogi Berra – he knew them all. But while attending college in 1962 at Michigan State University, he began to notice what he felt was a change in the players’ motivation, and he didn’t like it. And just like that, the one-time Yankees superfan gave up on the sport he loved and lost interest in all other professional sports as a whole. 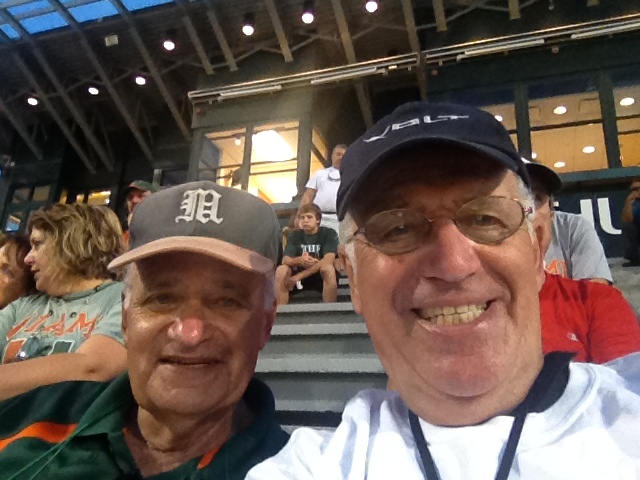 Fast forward over 50 years later, and Kaffee, 73, is arguably the University of Miami baseball team’s biggest fan. He hasn’t missed a single home game at Mark Light Field since purchasing season tickets in 2002. He sits in the same spot each and every game – in the bleachers behind home plate – where he analyzes and tracks every play on his printed scorecard. And if that wasn’t enough, he listens to the university’s student radio broadcast through his headset while he watches. Mike Kaffee (left) sits in his usual spot at a Hurricanes game with his brother Jeff (right). Photos courtesy Nikki Kaffee. Suffice it to say, he is what people would call a true fan. But, how did Kaffee go from giving up on professional baseball to being so passionate about college baseball? He says it was by accident. Kaffee was in the Air Force for 20 years after college, where he eventually became a navigator. He started dating a woman he was stationed with in North Dakota, and when she got assigned to Key West, Kaffee decided to follow her. He went to the nearest Air Force base. “I called up my Air Force military personnel and told them that they owed me, and they said ‘Yes we do,’” said Kaffee, who requested to be relocated to Homestead. Homestead was a fighter base and Kaffee worked in heavy aircraft, but his personnel told him if the wing commander accepted him, that they’d let him go. They did, and Kaffee traveled to South Florida. After retiring from the military in 1986, he chose to use his background to become a cop, specifically a security police commander. Then, in 2001, Kaffee’s life changed forever. Turns out, UM had one of the best programs in the country. Kaffee kept that in mind. During the game, he saw his first triple play. Then, in the game’s most pivotal moment, there was a Miami player on first and second base, and the Hurricanes were down by two runs with two outs in the bottom of the ninth. Next thing he knew, a walk-off home run. Kaffee is now retired and lives in Key Largo, and he makes the one-hour drive to Coral Gables for every ball game. After the game is finished, he usually reaches home after 11 p.m. That’s when he writes his post-game report, which he sends out to an email list of around 110 people, sometimes at around 2 or 3 a.m.
Kaffee has always liked to write, and he says he has developed such a passion for the sport that he gets totally involved in the analysis and enjoys himself in the process. He has developed a consistent group of readers through word-of-mouth. Readers find his report not only fun but also insightful. Former WVUM sports director Harry Kroll says the recaps are very helpful because it is where many broadcasters get some of their notes to use for the play-by-play call. Kaffee is very opinionated in his analyses and is often brutally honest on how he feels about the team and the decision-making during the game. Kaffee has thoroughly immersed himself in the environment at Mark Light: he has not only built relationships with the players – many of them know Kaffee on a first-name basis – but also with the families and the media at the ballpark. Kroll said he would never forget his interactions with Kaffee, as well as the impact Kaffee made on student broadcasters. Kaffee is known to constantly support the student work and provide feedback. Kaffee’s daughter, Nikki, is not much of a baseball fan, but she sees the positive effects the sport has had on both his life and the lives around him. 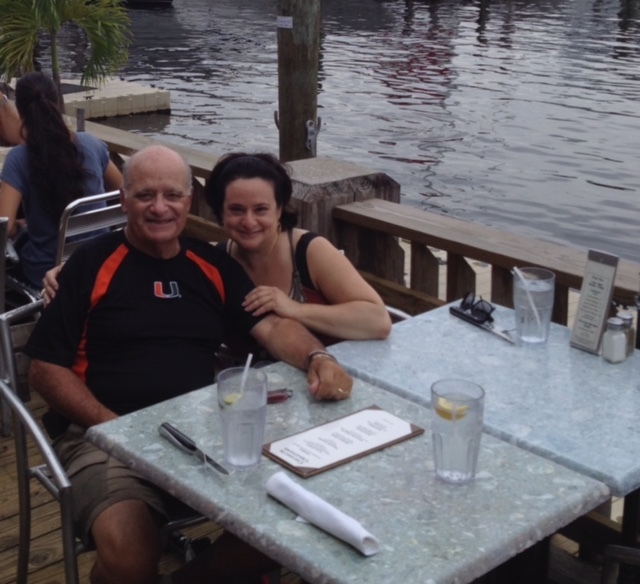 Mike Kaffee (left) and his daughter Nikki (right) enjoy a meal by the water. Both Kaffee and his daughter admit that the sport could sometimes get in the way of other aspects of life. Regardless, this does not harm their relationship. The two talk every week, often after baseball games. So the question is, will he ever stop this streak? And if so, when?